Xenoblade Chronicles 3D -- a portable adaptation of the Wii RPG classic -- was announced alongside the New 3DS in Japan last year. The New 3DS launch came and went in that region with no solid news of a release date for the game, but today's Nintendo Direct has confirmed that we'll be getting it a lot sooner than expected in the west. The title hits store shelves on April 2nd in Europe and a rather less specific "April" in North America -- a pleasant surprise when you consider that many assumed the west would have to wait a little longer for the title. The port is being handled by US studio Monster Games, who previously transferred Donkey Kong Country Returns to Nintendo's portable. The game will be exclusive to the New 3DS -- so it won't run on the original 3DS, 3DS XL or 2DS -- and will use the bottom screen as a map. There will also be a special mode where players can view the game's 3D models from any angle, as well as listen to the game's brilliant musical score. This is the first title that requires a New 3DS console to run -- so will it make you upgrade if you weren't going to already? Let us know by posting a comment below. Do you think they'll release the original on the Wii U eShop, or do you think they'll force people to buy the remake? I must save up for the new 3DS now.. I'm going to buy this to support Xenoblade as a franchise but I don't think I have it in me to sink another 180 hours into this game, despite how wonderful lt is. They should put this on the Wii U eshop too! 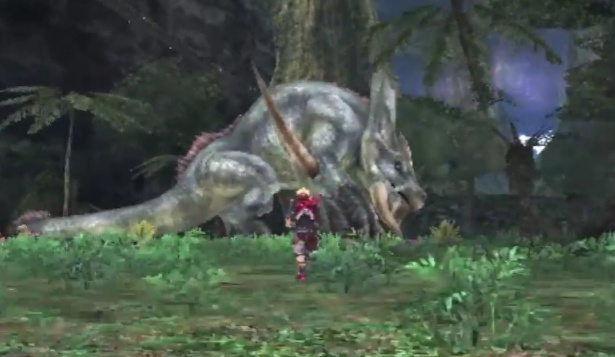 I'm definitely getting a New Nintendo 3DS XL for Xenoblade. Awwww, dammit! There was this persistent rumour that the game would have more content than the Wii original, so I kinda hoped they'd add the missing Left Shoulder of Bionis they had to cut - and now it turns out that it's "only" the gallery viewer, which I do like a lot nonetheless. I might not even own a "new" 3ds by then, but I'll definitely buy this game at launch. I loved the wii version and playing it on the go is amazing. Wishful thinking on my part, I hope they release a special bundle pack that includes the New 3ds (non-XL). That would be perfect since I'm not planning to get the XL model and I never played the Wii version, too pricey for a used copy. @Damo there's a typo at the start of the article - Xenoblade "Chronciles" 3D. I missed out on the Wii version so can't wait to pick this up. When you're in the game and staring at the pure scope of the environments, you really won't notice any blockiness. Waiting for the pre orders to pop up on Amazon etc. Can't wait! Yoppy , hurray , alright , I m excited love this game . It is amazing. @Captain_Gonru Digital release? I would assume they are going down this route with the game. Releasing a $10 DL on Wii U for Wii mode like the others certainly wouldn't help new 3DS sales any as this game is probably meant to do. I bought XC, KRTD and SMG2 last summer, about $50, $50 and $30 used (got SMG2 free w/ B2G1 coupon) so I won't be buying any DLs of those at any price. I'd still like to see them offer XC to break the Gamestop exclusivity agreement, but I don' see it happening w/ this out. I'm sorry but the games looks really really awful! This should be brought to the Wii U as a Wii game download from e-shop instead of a crappy port to N3DS..
As a battle-hardened warrior, I thirst for action. Which means I despise RPGs. Not RPG elements like upgrading & customization. Just the whole idea of focusing on strategy instead of action. So tell me, is the battle system in this game action-oriented? i.e., If I hit a bit will my weapon swing or shoot simultaneously and will I have to dodge enemy attacks on the fly? Sorry, when you send $50 on a 3 year old videogame - that we previously owned, finished in 2 days so sold it back - the acronym sticks in my head. @Damo Understood; I look forward to the reaction articles for this Direct (in particular the views of some staff members on that Pokemon abomination). I never played this before and as I am not to keen toward sci-fi stuff (medieval is my jam) I was never interested in this. But man, that trailer got me reconsidering! Looks pretty neat, actually. Can anybody tell me a little more about this and what makes it so great and tell me whether or not I'd enjoy it? For reference, I'm a fan of old-school JRPG's like FF1-FF9, Chrono Trigger, etc. This looks terrible. The ~120dpi(? )screen is just not enough for this. This is 2015 Nintendo! And the New3DS has this screen too? Same Problem with MH3U/4U and to a small degree with the Zelda remakes. Xenoblade is an awesome game on Wii though. Getting it! Was already going to upgrade so this sweetens the deal. Ive been wanting to play this game for so long. To be fair, it always looks worse when you look at 3DS previews on PC. It will look a lot better on the system, but in the case of Xenoblade I think we all know the Wii version is what you should be playing if you want nice visuals and a big screen to really take in the open world this title has going for it. When does it come out in Japan? Because who knows when I'll get around to buying a New 3DS, but I'm planning on buying this game as soon as humanly possible. I thought it was coming in November! I was WAAAYYYYYYYYYYYY OFF.